The Progress-Focused Approach: What if your interest fades or is absent? I have received quite a few responses to my article Interests as drivers of competence development; most of them fairly enthusiastic. In the article I make an argument for structurally engaging yourself in and learning about what interests you. The word interest, in my article, refers both to doing and learning about what you find enjoyable and doing and learning about what you find important. 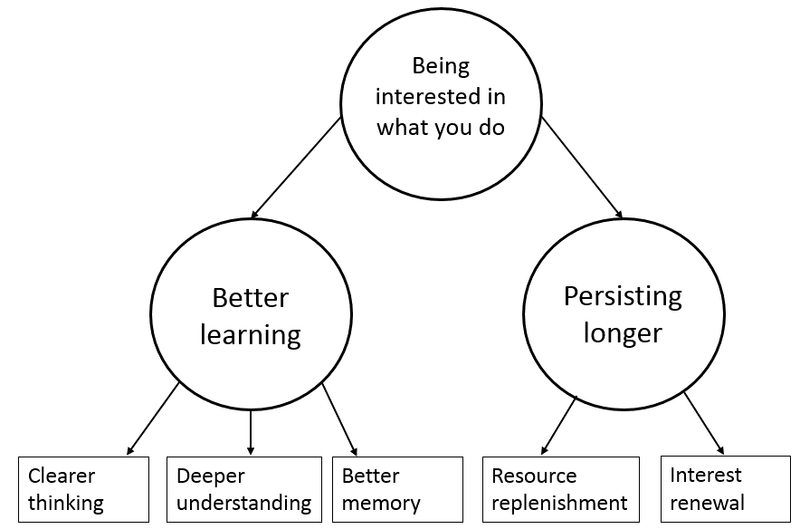 By focusing on what interests you your thinking is enhanced and it will be easier to persist (see more). Finally, in the article, I propose that interest focused development not only benefits individuals but also organizations. Here, I want to focus on two questions I have received about the article. The first is: what do you do when your interest fluctuates or fades? The second is: What can you do if you do not really know what you find interesting or if you do not seem to find anything really interesting? 1. What if your interest fades? Our feelings, motivations, and perceptions tend to fluctuate constantly and this also applies to our interests. That your interest in any topic will not constantly be at the same high level is therefore not surprising and does not have to be a problem at all. When it happens you may just decide to not focus on that activity for a bit and focus on something else which interests you more at that particular moment. When your interest in the original activity returns, for example in response to something you have experienced or read, you can just pick up the activity again. Another way of looking at this question is the following. When your interest in a topic diminishes this does not mean that you have to stop following your interest. Maybe it's just that your interest is shifting. Interest-focused development does not mean that you have to keep on focusing on what you have originally chosen as your topic of interest. On the contrary, it is very likely that over time your interest will evolve and shift, perhaps in rather surprising ways. Instead of asking yourself the question: do I still find this interesting you can ask yourself: what do I now find interesting? Of course, this way of working does not mean that you must jump through a wild variety of completely disconnected activities. In fact, it is not at all likely that you will want to do this. It is far more likely that your interest will evolve fairly gradually. For example, if you play the piano, you may notice at some point that you lose your interest somewhat in playing classical pieces and that you become more interested in playing Jazz pieces. You do not need to stop playing the piano but you can make a shift in your repertoire. 2. What if you do not know what interests you? This is perhaps a surprising question (how can you not know what interests you?) but I have heard several people ask it, so maybe it is not such as strange question after all. What I'd like to say first, as I have said in the article, is that all people are intrinsically motivated to seek interaction with their environments and to explore and learn things. We all have the capacity to like doing certain things. Also, we have all, to some extent, been shaped by the norms and values ​​in our environment which implies that we find things certain things important and worthwhile. Some people may not have learned to pay much attention to what they find enjoyable and important so that they are not too aware of what they are. But they are there. In general we can find out what interests us by carefully observing and reflecting on what we do and have done. While you are doing things you can, for example, pay careful attention to what you find enjoyable and what gives you fulfillment. What can also help is to also talk to other people or to write about what interest you in an interest diary. By doing these things you may become more aware of what you find interesting. Once that is the case, you can focus more consciously on doing and learning about these things.